Germany: Nestlé workers fight and win! 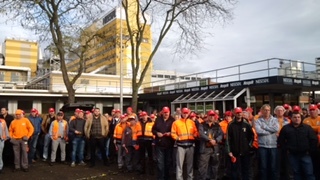 Thanks to their willingness to fight, the workers at the Nescafé Factory in Mainz will now have a decent foundation for their future. In March, Nestlé announced plans to close the factory by the end of 2017. According to the company, the decision was taken because the factory no longer corresponded to "today's requirements for a modern, efficient coffee production". According to the NGG, management recklessly neglected to maintain the factory, despite continuous warnings from the workers and the union. After long and difficult negotiations, supported by the workers who held assemblies at the factory gates, a settlement was reached on 19 December that now allows them to plan for their future. At an ad hoc meeting of the European Works Council on April 8 in Frankfurt, the union delegates from the plants slated to receive production (in the UK, France, Spain and Switzerland), committed to refuse any new work until all issues had been resolved to the satisfaction of the German workers.The IUF, the Nestlé European Works Council and trade unions throughout Europe sent messages of support and solidarity to the NGG and the workers fighting for justice, recognition and a decent foundation for their future. The members of the Nestlé EWC show their support (photo taken on 30 November 2016).